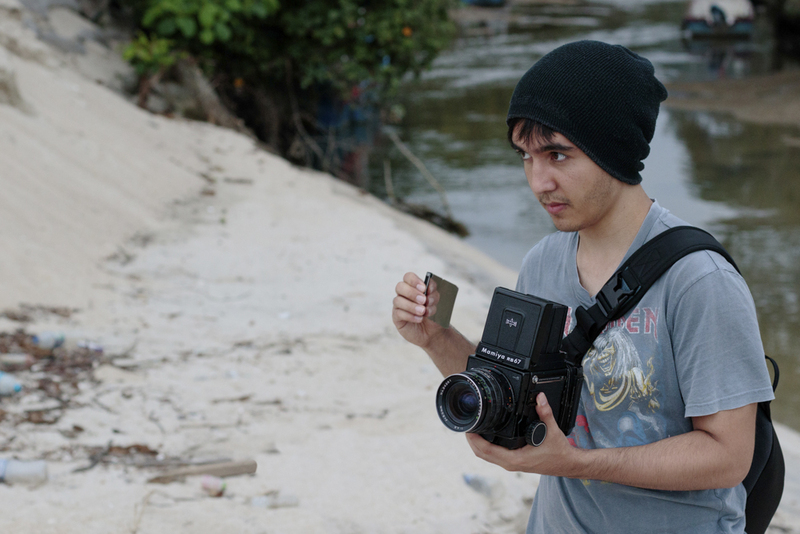 Antoine Loncle is a young Penangite who left the island behind to follow a common Malaysian dream: living abroad in a Western nation. But is Australia, where he lives and studies photography now, the promised land many Penangites think? Antoine photographing on the beach. Tanjung Bungah, Penang, Malaysia. © Raul Dhillon, 2016. I was born in Penang. With a Serani mom and a French dad, that phrase often confuses people. I’ve got a big heritage behind me, but I’m a Penangite to the core. I started seriously getting into photography when I was about 15, and got my first entry-level DSLR. Not long after, I discovered that the one thing I was drawn to, above all else, was people. I loved being out in the streets, or with friends and just capturing the emotion and the lives of people. My cousin Jaime and I were also starting a band at this point. We came up with the idea for Volatile one night and it felt as though it was the next day that we had roped a couple friends in and began practicing. As our band grew, so did my photography. Eventually, I started to mix the two by bringing my camera to a few gigs. I was instantly hooked by the challenging aspects of live music photography. It was a combination of everything I adored (people, music and photography) and I began doing it more and more. Inevitably, I got into film photography; I use it in all my personal work and day-to-day shooting. Now I shoot bands for publications as well as photograph for personal projects, and just for the fun of it! What are the things you like about Penang? Food. You will probably get this answer from everyone you ask, but it’s not without reason. I haven’t had better food anywhere else. Some of my favorite spots are all conveniently on one road and super close to home. I’ve been living in Tanjung Bungah for years now and a great place is Jalan Sungai Kelian. My personal favorite: Hillside Ah Soon Cafe, for some good Char Koay Teow. Not too far from that is another spot on the opposite side of the road. I forget what it’s called, but you can get good Curry Mee there, and of course, the best breakfast in the world: Nasi Lemak. From there, my favorite spot is just opposite of that: Gusto Cafe. They’ve got all your bacon and coffee needs covered, and when I’m not out photographing or eating anything, I’m always there hanging out and enjoying a big latte. In the evenings, this little street is also home to a man of legend; the famous Uncle Burger. From what I was told, he and his burger truck have been there since my parents were teenagers. You’ll have to wait in line for awhile for one of his creations, but trust me, it’s well worth it. And if all that wasn’t enough, there’s even more at the nearby food court. But besides the food, I love Penang for its heritage. Georgetown is a great place to explore and to photograph. There’s always so much going on, with so much history behind it, it’s hard not to feel enamored by everything happening around you. The arts and music scene has really been picking up over the past couple years and it’s great seeing Penang grow into such an artistic place. And what you don’t like about Penang? Coming from Melbourne, I have noticed something I never really paid much attention to. Penang is so hot. Hot and humid don’t make a good combination for me. I sweat so much when I’m in Penang, but it’s a small price to pay for everything else. Why did you leave Penang, and when? I left Penang in February last year (2016) to start my degree in photography. It was tough to have to choose between music and photography, especially leaving straight after our first album release. I left because it was just something I was always going to do. I got into a good course and had a chance to move with some family to cut down living costs. It was now or never. Roadside hawker stall. Chulia Street, Penang, Malaysia. © Antoine Loncle, 2016. Why did you decide for Australia? I guess it’s for the same reasons a lot of people have. It’s closer to home, compared to Europe or the States and it’s a great place in general. There’s quite a Malaysian myth about moving to Australia and live better lives. How that resonated with your own experience? Is Australia better than Malaysia? How? I do agree with that. A lot of people do decide to leave for Australia and for many other countries. When I was still in Malaysia and in high school, some of the phrases I would hear most often from my mom, my grandma, and all the other uncles and aunties were, “Make sure you study hard so you can get good grades and go overseas. It’s no use staying here” ­— I’m sure I’m not the only one with this experience. Even when I was back in Penang recently, all I heard when I told anyone I was studying in Melbourne was, “Good. Stay there”. All this got me thinking and questioning if this was the right attitude we should take on when thinking about studying abroad. This led me to begin my currently ongoing project, which I plan to turn into a book, that aims to explore why people think this way. Personally, the reason I left was mainly that I wanted to see more of the world than what I was used to. I wanted to grow as a person and experience things outside my ‘bubble’, so studying abroad was a great way of getting some perspective. I don’t think I’m on either side because I’m hardly anyone to be telling people where life is better. Everyone has their personal opinions and preferences. But I will say that if there is an opportunity, take it. By the time you reach that crossroad, you would already have spent a quarter of your life; there is only so much you can experience by living life in one place. There’s a whole world out there for you to explore. Busy fishing docks. Tanjung Dawai, Penang, Malaysia. © Antoine Loncle, 2017. My grandfather had a very strong influence on me and he was a firm believer in the whole, “if it’s broken, you fix it, not throw it away” mentality. Just ask my grandma — she’ll go on for ages about all the stuff he refuses to throw away. In today’s society, this idea has become somewhat old-fashioned and, as such, we have drifted away from these ideals. When we crack the screens of our smartphones, it’s often we take the easy way out and leave the screen cracked until the next iteration appears and the old one is discarded. But this shouldn’t be the way we act when it comes to a country. I guess my point would be: yes, if you get the chance, leave. But once you’ve done what you’ve intended to do abroad, come back to Malaysia. Use the experience and the perspective you have found to make your community a better one. Because if we really believe that, “there is no use staying here”, shouldn’t we try to make it so that it’s worth staying in the first place? Are you a Penangite/Malaysian living abroad? Do you relate to Antoine’s story? Please comment below or get in touch with the Penang Insider – we want to hear from you. Does leaving Malaysia to live in Australia really means seeing the world? I’m half Chinese and half Penarakan and had lived in Sydney for 4 years. I’ve never experience so much racism there compared to the other western countries I’ve travelled to. People in, for example, the UK and NZ don’t even come close to the in-your-face racism targeted towards the Chinese and Indians living in Australia like a lot of the white Australians. Australia is one of the most racially close-minded country I’ve ever been in, though they like to think themselves otherwise. The UAE is another one. Of course, one might say there are better chances and career opportunities in big cities such as London or New York than Penang. Well, to each his own. But at the end of day, I feel Penang is a still lovely place to live in. I agree with what Antoine said, once you achieved what you want to do abroad, you can always come back home. Hi George, thanks for your comment. I hear you: I was in Australia as a backpacker working in a pizza shop in Darwin… and travelled half the country in my van. Couldn’t do much more than baking pizzas, as there was quite a stigma against my category. I had a one-year working holiday visa, but for similar reasons to the ones you mentioned, after 6 months I decided to return to Malaysia. I agree with you: it’s good that young Malaysian travel abroad to learn, first of all, that Penang (and Malaysia) is nearly not half as bad as they think. And second, to bring back some valuable experiences they can help their own local communities with. I’ve got a different take, being a white Aussie who works/lives with many O/S students and who yearns to be in Penang far more than I can manage. First, I’m afraid you’re probably right, George, about Aussies being racist but not thinking they are. As with all generalisations its got its exceptions, but i see it as a white person and I’m ashamed sometimes. I’m really sorry it’s like that. Second, there are those of us – like my wife and I – who have taken our 4 kids to live in Malaysia for 4 months, precisely so they see beyond the often self-interest-motivated society which is increasingly modern Australia. And Marco, thanks for this reflective piece. I hope you come to that point in your life where you find peace and love and can take that wherever you go. One thing I’m sure about is that life is about much more than satisfying our wanderlust. And pointing others to how our travels can help us be better citizens is something good. Good on ya mate! thanks for your comment and yeah – I never wanted to stereotype ALL Australians, although George’s view is unfortunately quite true, as you say. I spent A LOT of time in Darwin, and became unwillingly quite conversant in the thorny subject of Bogan-omics 🙂 Also, yes: I have found peace and love, translated into my wife Kit Yeng. She’s so petite I can really take her with me anywhere I go and, best of all, she’s from Penang. We wish to help people, as you say, appreciate more than meets the eye on this very peculiar island. Thanks again for commenting and sharing your opinion! I have been living in USA for over 20 years now. 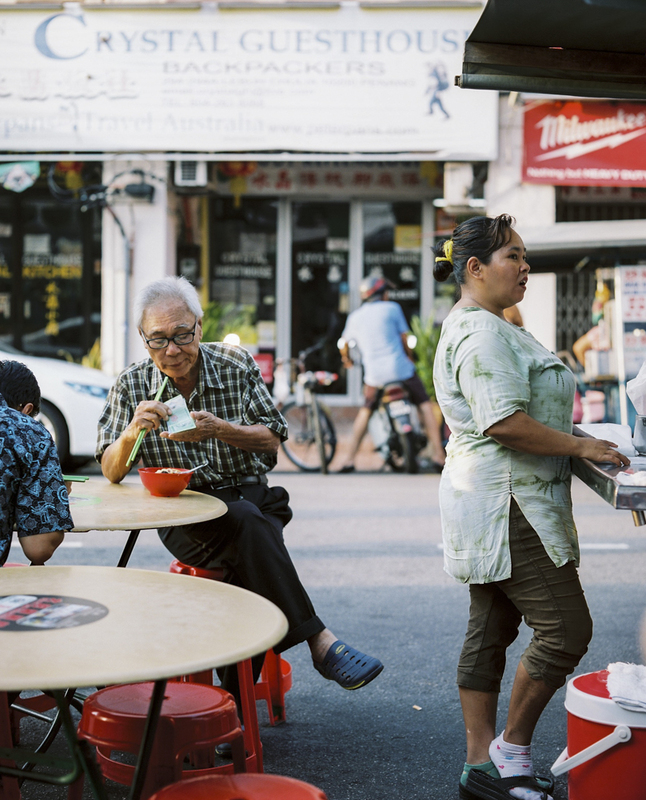 I left Penang for Singapore in hopes of finding a better life for myself. That didn’t happened. With luck I landed in USA a few later and stayed. When I left in the mid-90s, I will say that there was more opportunities in USA then there was in Malaysia. I agree with Antoine – it’s good to experience the world but come back to Malaysia to better your communities and country. Hindsight, I wished I did that. But now with marriage and kids, my life is here in USA. USA has given me opportunities that Malaysia could not back then. These days, with the advancement of technologies, internet, and economy, I believe that you, fellow Penangite and Malaysian can make Malaysia a great country. Same as with Australia, I faced racism here as well. I still remember my first encounter, it left a bitter taste. Racism is everywhere, even in Malaysia. Looking back, I can say my parents and friends, my friends and myself, are guilty of being racist to one another – just think of how you refer to someone of another race, it’s as simple as that. I’m proud of our younger generation these days, compared to when I was their age, they are now way more informed and mature. Keep up the good work Marco and Antoine. Another white Australian here who sadly has to agree that racism & jingoistic pride run rampant in this country. Due to ignorance, of course, a very sub-standard education system, decades of ultra-conservative governments & a highly-controlled media & deliberate “dumbing down” social engineering etc… This country has alienated itself from its Asian neighbours which displays a ridiculous lack of vision as a so-called “First World” nation. But I agree with Sally, the younger generations seem to be a ray of hope…hopefully. I think the internet plays quite a revolutionary part in this. Well obviously it does, or governments wouldn’t want to so desperately stifle it. The world is transitioning.